11,000 Irish fans packed into the SSE Arena, Belfast, for an enthralling night of World Championship boxing courtesy of Frank Warren – with Zolani Tete, Jamie Conlan, Paddy Barnes and Carl Frampton on the card it’s hard to tell who the main headlining act was but, boy , was it a brilliant night in Belfast. The returning Jackal was in his first bout under MTK-management and in his new promotional agreement with Frank Warren and his homecoming featherweight (technically catchweight; 1lb above the featherweight limit) contest was against, Mexican, Horacio Garcia – a 33-3 fighter looking to cause a major upset. 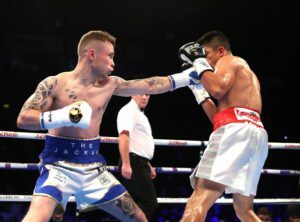 Coming off the back of a majority-decision loss against Leo Santa Cruz (the rematch to their first bout that Frampton one), Frampton was hoping to get back into World Title contention with a convincing win over his 27 year old opponent whereas Violento was seeking to propel his name into the spotlight. A two-weight World Champion, it’s in the balance as to whether Frampton continues in the featherweight division or jumps up to Super-Feather in an attempt to become Northern Ireland’s first ever three-weight world champion – first though, he’d need to get through Horacio Garcia. There was a reception befitting royalty that greated Frampton to the ring for his 25th fight – his 24 previously yielding just the single loss – and both fighters entered the contest at 9st 1lb with Garcia possessing the 3inch reach advantage. With 10 rounds scheduled The Jackal was looking to put to work the old adage that you don’t get paid for overtime and finish his opponent in emphatic fashion. Taking to the centre of the ring Frampton, the shorter fighter, eased himself into the round before landing with a crouched left hook to signal his intent to both his opponent and the capacity crowd in the SSE Arena. Starting off on the back foot – but without Garcia pressing anything of note – he appeared to be measuring out his opponent before swinging with quality shots round the guard of Garcia, slamming in the right hand to the cheek with split-second timing. Fast, fleeting, footwork combined with lucid upper-body movement saw him evade the infrequent jabs coming his way, much to the delight of the crowd. Packing a real crisp jab, The Jackal kept it popping into the body of Violento to distract from the overhand left that landed with alarming regularity to the Mexican’s head. Garcia failed to land anything without coming forward and, when he did, Frampton hit back by leaping onto the front foot and lading with sharp combinations to the inside body. Looking confident yet not cocky, Frampton really was moving through the motions during the opening stanza of the bout with a high tempo forcing his 36-fight opponent into sloppy mistakes, slipping back onto the ropes and inviting the pressure from Frampton. Opening up in the third by leaving his left hand hanging in front of Garcia’s face, the EU Amateur silver medallist, landed a cracking shot in the middle of the round to snap the neck back of his 27 year old opponent. Despite all the artillery coming the Mexican’s way he seemed undeterred from staying true to his fighting style, keeping a high guard whilst occasionally dropping down to throw body shots at Frampton. A durable fighter his three defeats have all been on points with one of them avenged a mere two months later and his 24 knockout victories out of 33 show that he’s not to be taken with a pinch of salt. Wild, swinging, left hands started off his 4th round as Saul ‘Canelo’ Alvarez sat front row cheering his fellow national on and he landed his first shot of note about 45 seconds into the round with a firm right hook to the body, swiftly followed with further clubbing shots to head and body. Frampton decided to stay and trade with his opponent, holding his feet in a style which probably favoured the Mexican but nonetheless the Jackal was determined to go toe-to-toe with his opponent. Garcia landed with consistency and pushed the two-weight champion onto the ropes, firing in with slamming shots to both sides of the Irishman before the tables turned and Frampton shimmied his way back to the centre with a stylish flurry to the head, backing Garcia away. Into the second half of the fight we went and it seemed to follow a similar script to the first with Frampton staying in control, working on that straight right followed by blindside left which was deployed to significant effect. Garcia would continue to fire back occasionally with a shot to remind the blue, white and gold wearing fighter of his presence but you’d be hard pushed to suggest he was troubling the pre-fight favorite. A minor cut emerged to the side of Frampton’s right eye but nothing worthy of anything other than a brief mention and Garcia seemed to gain confidence from this, taking the sixth round with eye-catching flurries to the body before taking a ramrod right hook flush to the temple, shrugging it off. The 7th round saw drama abound as The Jackal was floored in what was a blatant slip but Victor Loughlin counted it as a knockdown, getting up off the canvas he seemed bitter and enraged, throwing leather Garcia’s way with scant regard for the consequences. 10-8 for Garcia, presumably, the fight was in the balance. For a fight of this nature to be overshadowed by a display of sub-par refereeing of this magnitude would be unjust and Frampton set out with a point to prove in the 8th, going back to basics but slipping in almost the exact same spot again. He stayed on his feet and stood square in front of the Mexican, landing solid right hands to the body of the granite Garcia. The fatiguing face of Frampton painted a thousand words that preferably wouldn’t be uttered come the final bell but his work-rate and punch-quality was looking like enough to secure him victory in his first fight since January. Frampton’s footwear saw him come unstuck for a third time in the fight, slipping again, but with only one of those slips counting as a knockdown it was a rectifiable issue; Garcia proved to be the aggressor in the final two rounds, throwing all sorts of shots at his opponent in order to get ahead on the judges’ scorecards. Come the final bell there was a tangible sense of trepidation in the crowd as we went to the scorecards – 98-93, 97-93, 96-93 ; Carl Frampton beat Horacio Garcia in what has to be one of the greatest non-title fights you will ever see, guts, grit, glory, THE LOT. Jamie Conlan, the pride of Belfast, featured in his 20th professional fight as he took on Jerwin Ancajas for the IBF World Super Flyweight title – coming in as the long-odds challenger, Conlan was confident in his game plan against the cagey Filipino champion. Ancajas has the odd notoriety of being one of the most avoided champions in all of world boxing – despite the fact everyone wants his belt – and 13 knockouts out of his last 14 goes some way to demonstrating just why that is. The 27-1 man looked to make his third defence of the IBF title he took off McJoe Arroyo back in September 2016 and, in The Mexican, he was facing quite possibly his most gung-ho fighter in the whole of his career. Conlan was relishing this opportunity on the world stage and refused to let Ancajas’ reputation faze him during the build-up, insisting instead that the packed SSE Arena would be enough to see him over the line. Fighting his first southpaw opponent in 5 years, the 31 year old seemed to struggle to adapt to the style of Pretty Boy and looked quite uncomfortable in the opening stages of the first round with Ancajas staying at length and prompting Conlan to open himself up if he wanted to land shots of any real meaning. Unexpectedly after 90 seconds in the first round the Irishman shot down to the canvas with everyone in the arena bemused – no shots came in as he fell but as he got up it appeared to be something wrong with the lead leg. The crowd voiced their support to create a spine-tingling atmosphere that carried Conlan to his corner – a 10-8 round certainly not the start they would have been hoping for. Ancajas, wearing the red and white shorts, stuck to his deliberately cagey blueprint but failed to land any significant punches to trouble the maiden title challenger. Attempted roughhouse from the Filipino drew the ire of, referee, Steve Gray and caused a cut to the left-eye of The Mexican, prompting a stream of blood to gush to his eye. The 6-time All-Ireland champion (junior and senior) doesn’t have quitting in his vocabulary, however, and mustered up the spirit to draw him his corner and attempt to bring himself back into the fight. Patient, probing jabs provided little threat to Conlan but a straight right hand lead followed by a power left had the challenger rattled. A body shot sent him stumbling back but typical flamboyance saw him wave the attack on. Body shot after body shot had him tucking up, curling into a ball almost. Three successive right hands to the body followed flush by a left to the livers dropped Jamie for the second time in the fight. Momentum firmly in the defending champion’s corner, Pretty Boy know where to target and looked to exploit it as the fight entered the second third of the fight. Big right hands winded Conlan, the Filipino had him against the ropes and landed dozens of sharp, sustained punches to the body, inflicting maximum physical and psychological damage to the ever fatiguing Irishman. Down in the last 15 seconds of the round as a result of yet more body shots, a fist punched the canvas in frustration at the quality of fighter he was facing – Ancajas proving to be a class above but Conlan giving it his all. Finding spirit from no conceivable place, success was found with punches evading the guard of Ancajas but ultimately being nothing other than sighting shots as opposed to anything packing power. A point was deducted from the champion in the fifth round as he floored the black-and-gold wearing Irishman thanks to a third low-blow of the fight, if anything was to be the point at which Conlan got back into the fight then surely this would be it. Jabs aplenty found themselves rammed right down the throat of Conlan before he went down for a fourth time thanks to, in truth, a relatively nothing punch but when fatigue sets in, it’s a killer. Despite getting up and protesting the legality of the shot, the fight was ultimately waved off with the challenger looking dazed and distraught. Although unlucky to be stopped by a punch which replays showed to be to the back of the head, he was exhausted and didn’t realistically look like winning the fight so perhaps it was a case of pulling him out before any major damage had been caused. If bravery won you world titles then Conlan would have bags of them but, unfortunately for him, the fight went to Jerwin Ancajas owing to a 6th round knockout that took him to 28-1, stamping his mark as, arguably, the number one super-flyweight in the world. Paddy Barnes’ defence of his WBO European title failed to materialize and instead the flyweight fighter fought Eliecer Quezada (21-6) from Nicaragua for the WBO Inter-Continental title. Looking to his extend his record to 5-0, The Leprechaun knew he’d have to put in a better performance than the one he showed against Juan Hinostroza – a fight in which he admits he was less than impressive – if he were to get past the much underrated 26 year old in the opposing corner. Scheduled for 10 rounds Quezada looked light on his feet despite being the heavier of the two fighters – weighing in 2.5lbs over the flyweight limit – bouncing around the ring with the first minute seeing very little in way of punches landed. The taller, rangier fighter kept Barnes at bay for much of the first round with a constant switch from southpaw to orthodox stance but Quezada lay open to the faster hands, as opposed to feet, of his opponent who connected with successive flurries of jabs to the body. Just as the bell came in to signal the end of the first round a clash of heads between the boxers left the Nicaraguan biting the inside of his mouth and holding his mouth guard but, other than that, no damage caused. A somewhat stop-start round followed with Barnes attempting to suss out the experienced man opposite him but keeping busy with adept footwork before rocking Quezada with a good right hand; the legs wobbled and The Leprechaun pounced on the opportunity to land hard with speed and accuracy to fatigue the former WBA Fedecentro Light Flyweight champion. In the final 15 seconds of the round, a short chopping right hand came cascading into the cheek of Quezada as Barnes recorded his first professional knockdown, the fighter made the count rather laboriously but started the next round looking groggy. And the Irish Olympic and Commonwealth medallist showed his full range of capabilities as he stood in the middle of the ring trading with his man, reigning shots in with a degree of controlled recklessness; unsteady legs set in for Quezada in the concluding 30 seconds of round three but despite this landed a successful right hand of his own that kept Barnes in check. Square feet and punching fresh air sapped the energy out of the travelling fighter as the Belfast man maintained his patience in waiting for a natural opening as opposed to forcing the cause. Both fighters took a relative breather in the fourth round but it was Barnes who maintained in control of the bout before unleashing some passionate punches towards the backend. A performance that appeared exponentially more mature than any we’d previously seen, this fifth professional fight seemed to be an opportunity to showcase his skills for a potential world title challenge but in the middle round he was given his last warning for a low-blow, although a minor infringement it must be said. Following that the Nicaraguan connected with his best shots of the fight, leaning in with his whole body and jumping into some shots with real venom – a good spell of sustained pressure saw Quezada land with headshots and garner a foothold in the fight, was momentum shifting in his favour? A rallying Quezada managed to survive a furious onslaught of punches from his opponent four years older than him but the agony on his face was plain to see as Barnes managed to regain his composure and landed a sensational left hook cracking the ribs of the Nicaraguan. Sinking to the canvas in a manner more like he’d been shot by a sniper, the writing was on the wall as he hit the floor for the second time in the fight. Set up by a left hook to the head, the quick change down to the body proved to be the end of the fight as, referee, Steve Grey counted out The Huricane in the 6th round as Paddy Barnes recorded his first ever knockout from his 5-0 record. An ever burgeoning army of fans, the WBO Inter-Continental Flyweight title and a Top 10 ranking for The Leprechaun, it’s fair to say the future is looking pretty bright for this amateur-turned-pro sensation. In the other World Title bout on the show, Zolani Tete was defending his WBO Bantamweight title against Siboniso Gonya and during the build-up had vowed to give his fellow South African a maximum of four rounds before knocking him out. At 25-3, the two-weight World Champion went into the ring, on the back of a Unanimous Decision win against Arthur Villanueva, at 8st 5.5lbs whilst the challenger, who’s last win was against Immanuel Naidjala, was slightly lighter weighing in at 8st 4lbs. On paper Tete was the heavy favourite, possessing the greater knockout power with 20 of 25 victories finishing early as well as a 3inch reach advantage to help dictate the pace of the bout. Looking for a unification scrap with Ryan Burnett, Tete wasted no time in storming out of the blocks, leaping into the centre of the canvas. Gonya had no time to settle himself into any sort of game plan and Tete landed a flush right hook around he guard to the chin of the challenger on the six second mark. Down went Gonya in what initially looked like a flash knockdown and, indeed, Phil Edwards began the count before the sudden realisation that the, previously, 11-1 fighter was out cold upon impact; the fight was waved off and concern grew as to the welfare of the KwaZulu-Natal resident who laid motionless for about 40 seconds. Having displayed such explosive, raw, ability in the short 11 seconds that this fight lived it’s clear to see why Tete remains such an avoided boxer with very few men willing to get into the ring with such a risky fighter who can turn it on in an instant. Subject to confirmation, the one-fight punch goes down in history as the shortest (in terms of time) World title fight of all time and Zolani Last Born Tete moved to 26-3 before remaining humble in his post-fight interview, even in his call-out of Burnett, as he sets up a potential Bantamweight unification showdown in 2018. An honourable mention for Jono Carroll who was given a late setback when Declan Geraghty pulled out of their rematch and, instead, he fought (15-4) Humberto de Santiago for the IBF Inter-Continental Super Featherweight title. Keeping the pressure high from the beginning it was an absolute brawl from Carroll who was twice warned for low blows but went for the kill as soon as the first bell went and a gritty, gutsy, display earned himself only his second ever professional knockout victory to move to 15-0 courtesy of a 3rd round stoppage. Also on the card former ABA Champion Alex Dickinson looked lacklustre as he advanced to 3-0 in the heavyweight division thanks to an scrappy points decision against, a journeyman who came to trade, Milen Paunov to make it 3 knockouts from 3 fights; Marco McCullogh beat Josh Baillie (5-3) in his first fight since losing in a British title fight against Ryan Walsh as the featherweight made it 18 and 4; and cruiserweight up-and-comer Tommy McCarthy successfully broke down Blaise Mendouo over 6 rounds to improve his record to 11-1. A brilliant Belfast barnstormer filled with pure boxing beauty saw 11,000 Irish fans singing loud and proud at the return of an Irish hero, the birth of another and one brave brother who gave it all but came up just short. Conlan will come back stronger though, don’t doubt that and Ireland is THE place to watch going into 2018 – Frampton, Barnes, both Conlan’s and, of course, the potential for a unification between Zolani Tete and Ryan Burnett. No-one does it better than the Irish, why did we ever doubt it?